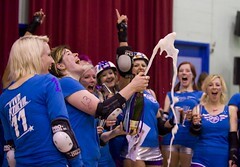 Roll Britannia – Europe’s first Roller Derby knockout tournament! 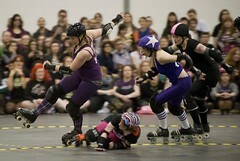 Organised by the lovely London Roller Girls, it saw a complete weekend’s Roller Derby action with Teams from all over. Auld Reekie and Central City Shown battling it out here on the first day. I was provilaged to cover the weekend as anofficial photographer, and even though it was incredibly intense and hard work, it was also great fun…roll on next year! Two lots of them, in fact, as ahead of the Championship Final (Suffra Jets 97 – 73 Steam Rollers, well played both teams! ), we also had the bonus of the Ultraviolent Femmes taking on our German visitors, the Barockcity Rollerderby, who got rather hammered by the much more experienced team (171 -15), but fought gamely and certainly didn’t disgrace themselves – Look forward to seeing them back, stronger and hungrier next time. Mucho credits to all the ladies, and all at the LRG for putting on quite a show. I was privileged to be an official photographer this time, and although not on top form with the camera, still enjoyed it hugely. And some more lesser ones on Facebook Here, and Here too.